Stalker901: When r u coming out? Stalker901: Nerd, i meant out in public. BubbleBOI1219: LOL this weekend. $35 to hear about my life. Stalker901: People pay to hear about your life? SUCKAS. Stalker901: FAIL. You IMd me. OH THAT JACOB. He's always pretending to forget about my existence, for laughs. And I really am going to Seattle early tomorrow morning and won't be back until Tuesday night. For a while I was concerned that my trip would overlap Stephen's stay, since he was hanging out there FOR MONTHS making some movie or something. 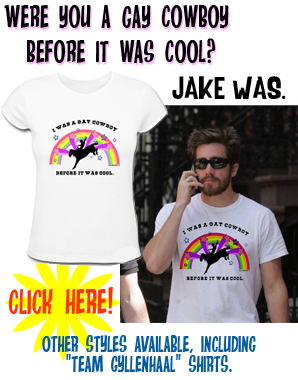 A picture of Jake Gyllenhaal unrelated to anything mentioned in this post. Blues Bikes and BBQ is bogging up my city streets. 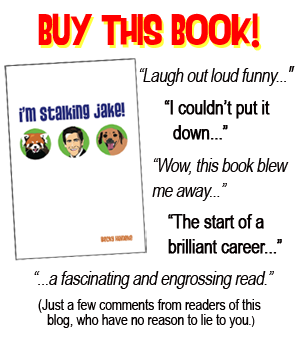 As soon as the motor cycles are gone, I am off to Barnes and Noble for I'm stalking Jake the novel, can't hardly wait!!! It is SO good to have you back even if it is just today & we will be waiting with bated breath for another ISJ jewel of a post. In the meantime, the forum is becoming quite fun to while away the time waiting patiently for the return of Prophecy Girl's infinite Gyllenwisdom. Gail, just a note to say I'm Stalking Jake is "non-fiction", not a fictional novel. Have a good trip PG, you never know with Jake stalking you like he does, he might come meet you in seattle!!! Oh I know that,coffecat I was just trying to be funny. I have been hanging out with the Jake Watch/Jake Weird, WDW crowd now for years. I think I understand a lot of humor, thanks Ya'll. Every time I try to "correct" someone I'm wrong. So why do I compulsively keep doing it?? Ack! Dissension in the ranks! All I will say is that Gail has MY ETERNAL GRATITUDE FOR LIFE for buying a copy. :D I can't even express how happy I am that people are getting it, reading it, and now talking about it. SO THANK YOU! WOW who knew you and Jake texted! And he goes by bubbleboy? I have a pic I'll post in the forum if no one else has already of him from last night. 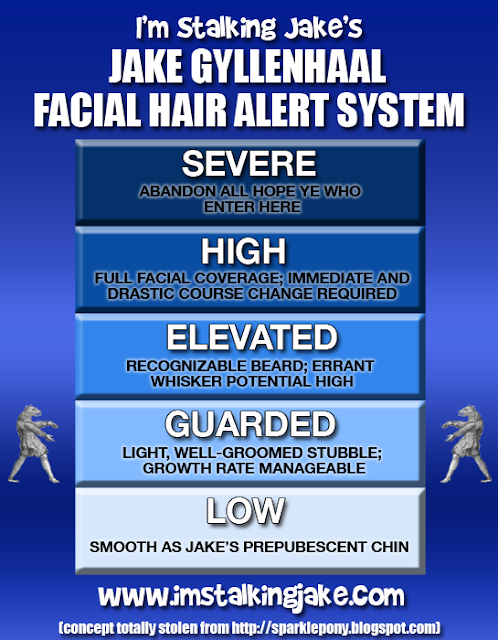 the face rug is still there, but looking trimmed I have to wonder if it is for a role.